Home > News - June 2016 > India-UK Trade Relations - Which Way Forward..? 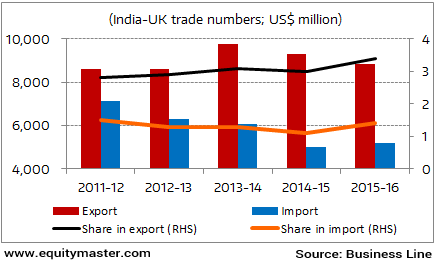 India-UK Trade Relations: Which Way Forward? The UK is an important trade partner of India. Its share in India's total exports has been steadily increasing over the past 5 years. In absolute terms too, our imports and exports with UK stand at a significant level. With the Brexit happening, the dynamics of India's trading relations with not only UK but the whole of the EU might undergo a change. For one, it might mean more demand for Indian exports to the EU as products from UK might lose their duty free status. Further, jobs available to labour from the EU in Britain might see restrictions being imposed, perhaps leading to more opportunities for Indians there. The proposed free trade agreement with EU may also receive a fillip as the UK has in the past opposed a lot of EU decisions. On the flipside, there are also fears that the EU may dismantle altogether. There has been noise for sovereignty for quite some time in many EU countries. With the Brexit occurring, these voices may come back with renewed vigour. If such a break up were to happen in future, India's trade with the entire region may see big changes.